Either The Austin Carolers or The Austin Carolers Too will cover the Domain gigs. Not sure which group will be on which date… one of our two teams, possibly both! Friday, Nov. 23, 5:30 to 6:30 p.m., Georgetown Square. painting circa 1955. It’s the big Lighting of the Square and Christmas tree, Santa comes, we all sing… very heart-warming. Bring your Thanksgiving guests and family — it’s worth the trip to Georgetown Square. Note: This event attracts a big crowd. Get here early! The Austin Carolers will wander the mall for your holiday shopping pleasure. Find us with your ears! We start at the stage area and move east, toward Nieman Marcus, then cross the street and move west, winding up near the Starbucks (next to stage/play area) by the end of the gig. We may be starting toward 7 p.m., as we’re coming from another gig. You know the drill: find us with your ears! Saturday, Dec. 15, 6:30 to 8:30 p.m., The Domain. 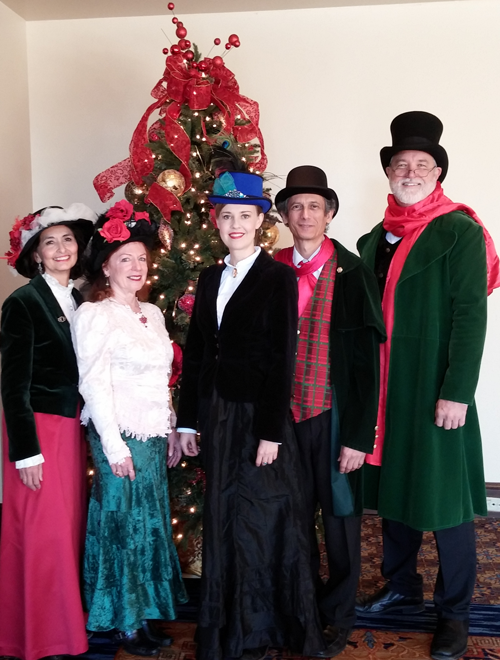 The Austin Carolers Too will be wandering the mall for your listening pleasure. See 11/24 for details. Shop ’til you drop and hear some fun music. Cookies for Caring event at the Driskill. The hotel teams with the Austin American Statesman’s Season for Caring to raise funds for families needing assistance. We donate our services to this event in full support of its goals. The $50 ticket is a worthy cause. Saturday, Dec. 22, 6:30 to 8:30 p.m., The Domain. We’ll be wandering the mall for your listening pleasure. This is The Austin Carolers’ annual end-of-season gig, which we love. We’ll be in The Gallery, for a post-dinner concert at the Christmas Dinner Buffet featuring magic and music. In between, we’ll be Caroling in the Restaurant, tableside and up close. Great food, valet parking, sinful desserts. Why not? Reservations for the buffet required. 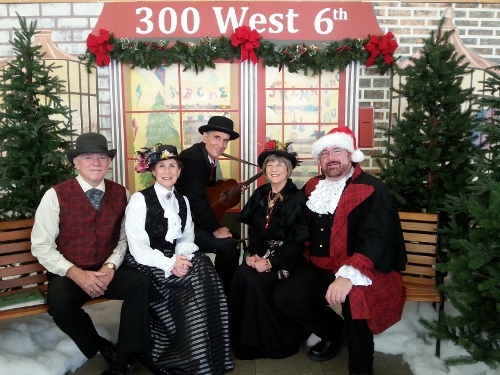 The Austin Carolers at 300 West 6th Street, 2015 season. and Interior Gardens for the gig. From the left: Paul, Mady, Art, Libby and Craig. at the Four Seasons Hotel, for AGC of Texas, 2015.